Enjoy viewing large files quickly with a high read speed of up to 150MB/s. 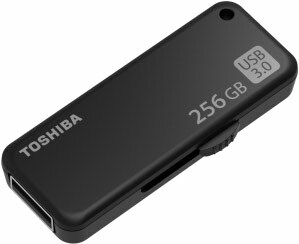 By embedding Toshiba 3D Flash memory BiCS FLASH™, the U365 is able to achieve large capacity up to 256GB. A tiny USB flash drive with enough space for hundreds of high-resolution music files and hours of video file. Simple shapes without ornate decorations have lasting appeal. The classic matte black body gives subdued and sophisticated feel to the USB flash drive. Capless and sliding retractable design for convenient use.